Summer comes with its woes. Those sunny, tropical beach vacations come with a whole lot of tan and sunburn. Light-skinned people and those with sensitive skin are more prone to sunburn than others. So, when you end up with those burning red patches on your skin and are looking for hacks to soothe them, we’ve got your back. If you are a believer in the healing power of essential oils, you’re going to love this article even more! If not, get ready to change your mind. But, before we get into that, let’s take a look at what kind of sunburn essential oils actually heal. What Type Of Sunburn Do Essential Oils Heal? There are primarily two kinds of sunburns – mild and severe. Mild burns fall under the first-degree burn category and can be dealt with using OTC lotions or essential oils. However, if you have moderate to severe burns, relying just on essential oils is not advised. 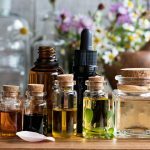 Essentials oils can aid your healing along with medication prescribed by a doctor, but they may not work well as stand-alone remedies in this case. Now, let’s check out the best essential oils for treating sunburn. Lavender oil is known for its soothing and healing properties (1). Hence, it has found a permanent place in many people’s bathroom shelves. Just add a few drops of lavender oil to your bath or your lotion before applying it. It is known to possess anti-inflammatory properties that provide instant relief (2). It also has a soothing effect on your senses and can be sprayed on your pillow to help you sleep better. Therefore, carrying a bottle of lavender oil in your travel bag is a great idea. 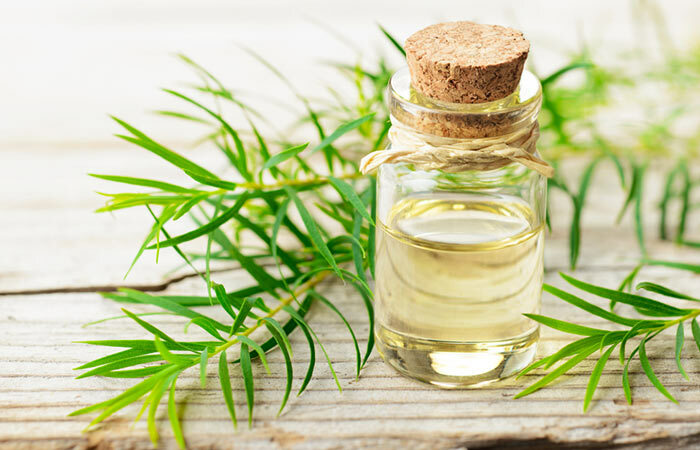 Tea tree oil is a blessing, and it comes to your rescue for just about everything (3). It reduces acne scars and inflammation and heals your skin. It is another staple that many people swear by. It prevents your skin from scaling or peeling when it is sunburned and also speeds up the healing process. A lot of brands make sunscreen lotions with a tea tree oil base to prevent sunburn in the first place (4). 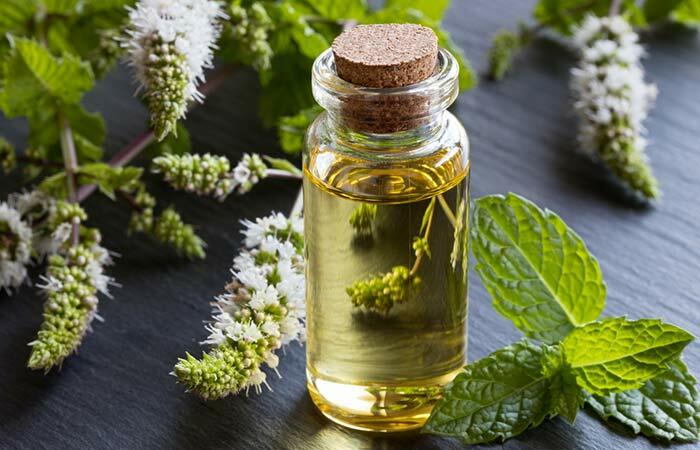 Peppermint oil contains menthol that has a cooling effect, which is why it is extensively used in skin care products like shower gels, body lotions, and hand creams (5). If you have mild sunburn, mix a little peppermint oil in a carrier oil (like coconut oil) and dab it on the affected area. Leave it on overnight, and you will see a remarkable difference the next morning. If you suffer from migraines caused by being in the sun for too long, you can use peppermint oil to get some relief (6). 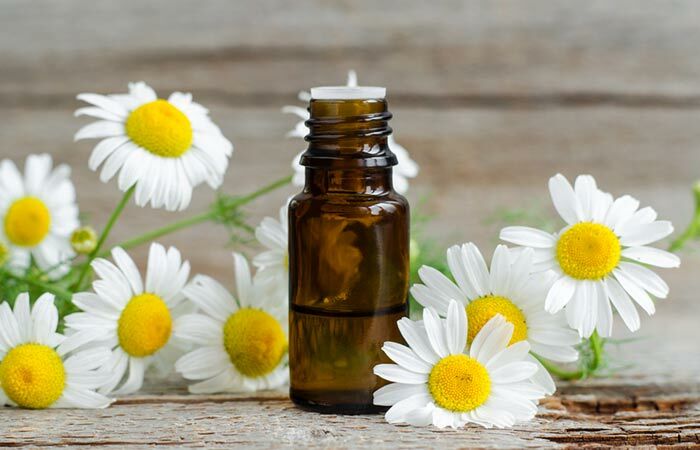 If you have ever been to a spa in your life, or have some idea about aromatherapy, chamomile oil is not new to you. It acts as a sleeping aid as it relaxes you, relieves stress, and calms your senses, particularly when blended with other calming oils like lavender and neroli (7). You can add a few drops of chamomile oil to aloe vera gel and apply it to the sunburnt area. Leave it on overnight. It will reduce the burning sensation and give you a good night’s sleep. 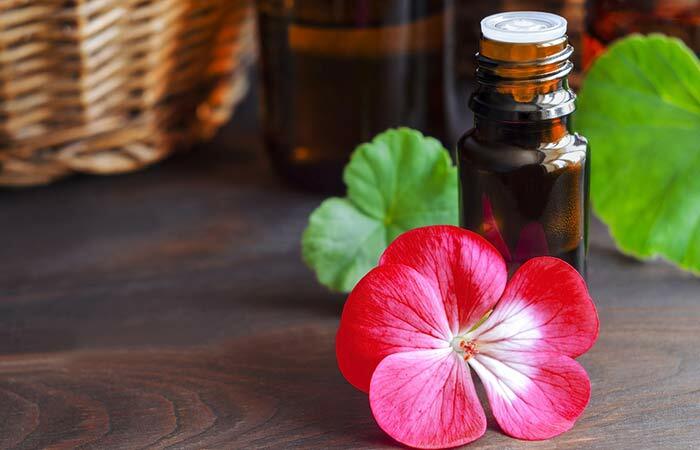 Geranium essential oil has restorative properties. This means that apart from healing your sunburn, it helps restore your skin’s health and promotes skin renewal. It is also antibacterial and can be used to treat other skin conditions like eczema, dermatitis, and issues caused by aging (8). Ask skincare or essential oil experts, and they will tell you that it is best to mix essential oils with a carrier oil before topical use. This is because essential oils are highly potent and concentrated extracts that can be too harsh on your skin. So, check out the next section to find out the best way to use essential oils to treat sunburn. What Is The Best Way to Use Essential Oils For Sunburn? Mix It With A Carrier Oil – Mix 2-3 drops of the chosen essential oil with one teaspoon of a commonly used carrier oil, like jojoba or sweet almond oil. Apply this mixture to the affected area and leave it on overnight. If it is during the day, leave it on until it dries up completely. Mix It With Aloe Vera Gel – Mix 2-3 drops of the essential oil of your choice with pure aloe gel and apply it to the affected area. Alternatively, you can also mix a cup of water, aloe vera gel, and 8-10 drops of essential oil in a spray bottle. 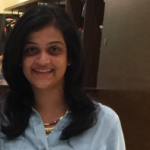 Store it in a dry place, and spritz it on the affected area once or twice a day. Add It To Your Bath – Add a few drops of the essential oil to Epsom salt and add it to your bath water. Soak in it for a while. It soothes your sunburn, relaxes your muscles, and refreshes you completely. Remember, these essential oils are to be used only to treat mild to moderate sunburns. If your sunburn is so severe that its blistering, oozing pus, or scaling extremely, consult a doctor immediately. It is always better to be safe than sorry, so invest in a good sunscreen lotion or spray if you are going on a sunny holiday. You can come back and use the essential oils for a few days to calm your skin. Do you believe in the healing power of essential oils? Do you have any tips we missed here? Let us know by dropping a message in the comments section below. “Lavender and the Nervous System.” Evidence-based Complementary and Alternative Medicine, US National Library of Medicine. 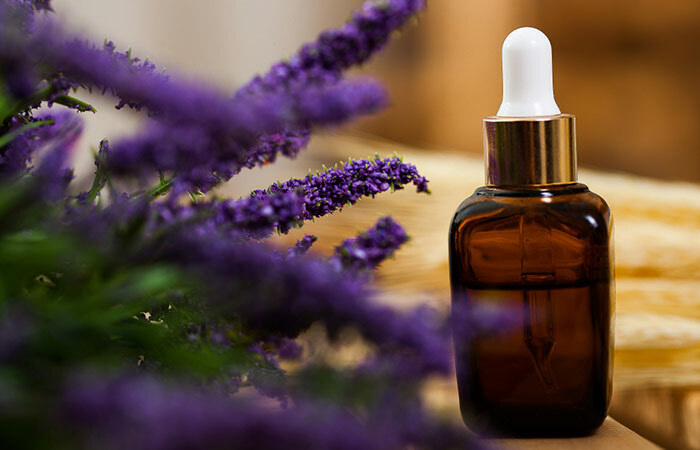 “Antioxidant, analgesic and anti-inflammatory effects of lavender essential oil.” Anais da Academia Brasileira de Ciências, US National Library of Medicine. “A review of applications of tea tree oil in dermatology.” International Journal of Dermatology, US National Library of Medicine. “Potential of herbs in skin protection from ultraviolet radiation.” Pharmacognosy reviews, US National Library of Medicine. “Menthol: a refreshing look at this ancient compound.” Journal of the American Academy of Dermatology, US National Library of Medicine. “Peppermint oil in the acute treatment of tension-type headache.” Schmerz (Berlin, Germany), US National Library of Medicine. “Effects of Aromatherapy on the Anxiety…” Evidence-Based Complementary and Alternative Medicine, US National Library of Medicine. 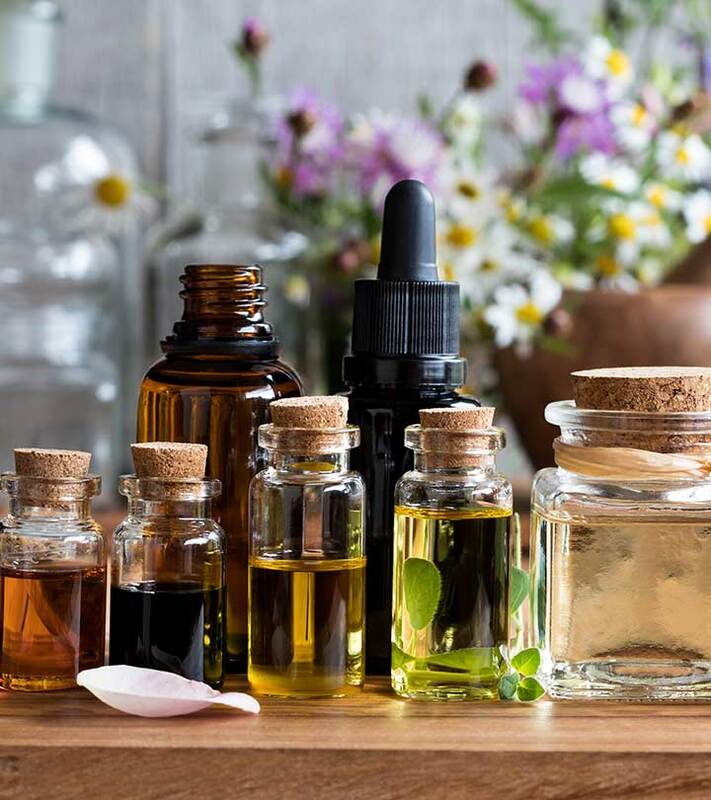 “Commercial Essential Oils as Potential Antimicrobials to Treat Skin Diseases.” Evidence-Based Complementary and Alternative Medicine, US National Library of Medicine.